Sand is spreading across our site. What can we do? Locate the sand play area away from primary circulation pathways and building entrances to avoid tracking sand indoors. Usually corners of the site or locations along the site boundary fence work well. Avoid locating it in low spots where water gathers when it rains. 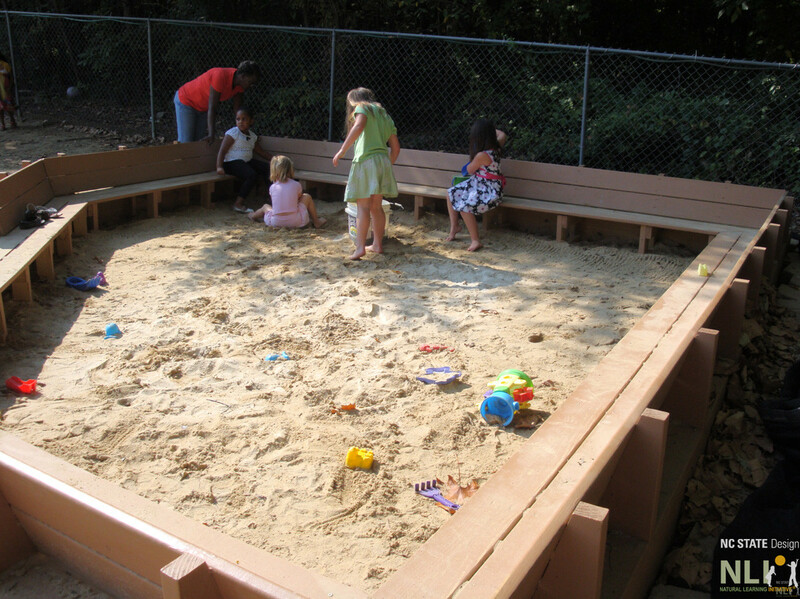 Enclose the sand play area on all sides, leaving a defined entrance/exit. This helps to limit the sand from spreading across the outdoor learning environment. Use cedar, pressure-treated pine, or recycled plastic timber to construct the enclosure. If this is too costly, logs, laid vertically or horizontally, or large, smooth rocks could be used to enclose the sand play area. Install a grate or boardwalk threshold at the exit to knock the sand off shoes. 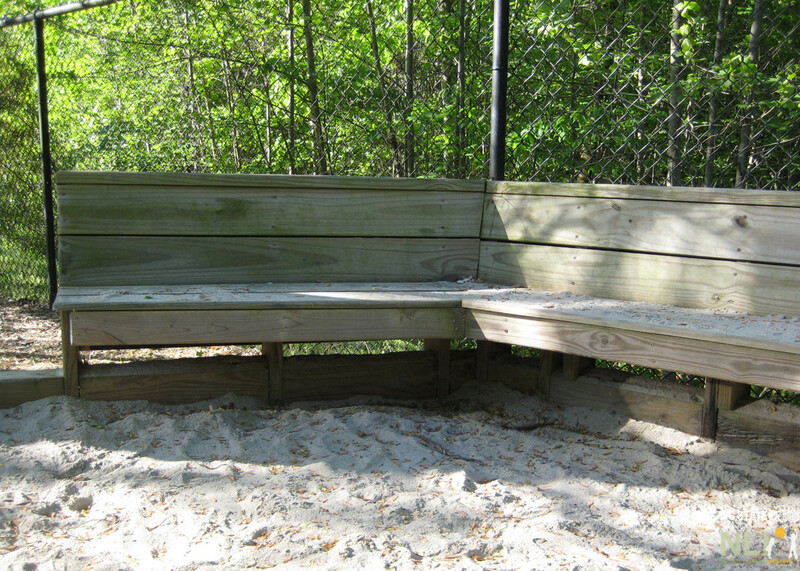 Construct a continuous seating bench inside the sand play area to serve the dual purpose of seating and offering a play platform. Storage cubbies for play props (shovels, trucks, scoops, molds and other loose parts) could be located under the seating bench or on the sides of the sand play area, easily accessible to children. Provide some type of shade canopy cover the sand play area to protect from harmful sun exposure. Trees, shade sails or timber shade structures offer alternative solutions. Surround the sand play area with a planting buffer to help contain the sand and provide natural loose parts. Cover the sand play area with a fine mesh net when not in use to prevent the sand from becoming contaminated by cats and other critters. A net will allow sun, rain and fresh air to get to the sand. 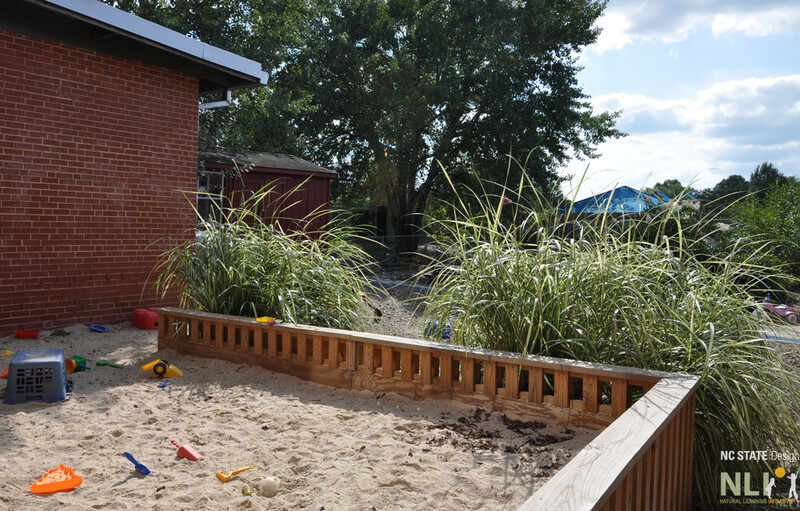 A timber barrier and ornamental grasses help contain the sand play area at Children’s Learning Center, Hillsborough, NC. A timber bench encloses the sand play area at Bright Horizons at Research Triangle Park. A timber bench wraps the sand play area at A Child’s World, Jamestown, NC. 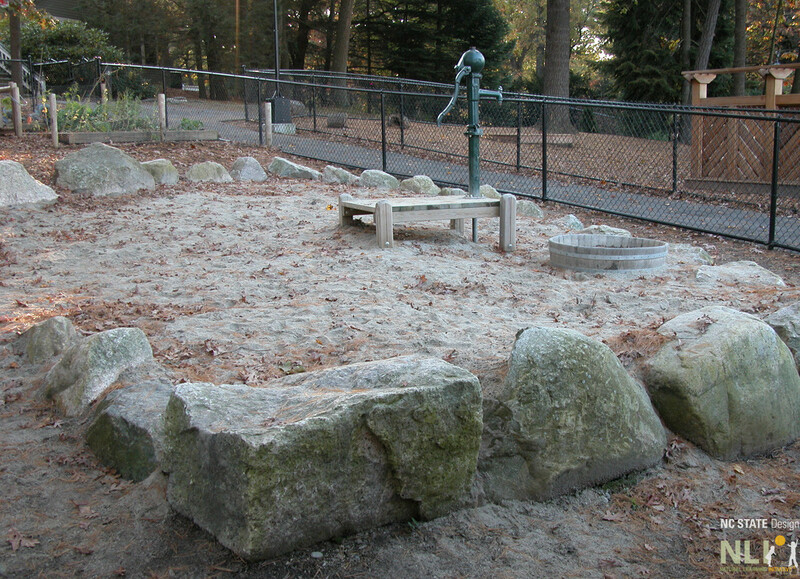 Boulders surround the sand play area at Wellesley College Child Study Center. Avoid using sand as a safety surface. Although, sand is an approved use zone safety surface, it is very difficult to contain and not an ideal safety surface. If possible, replace sand with an approved mulch safety surface.